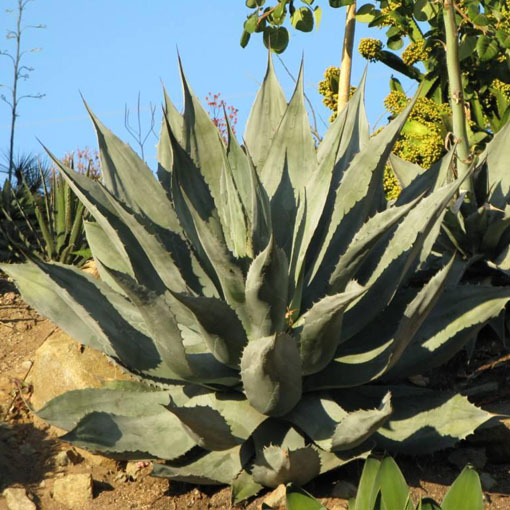 Agave aff. 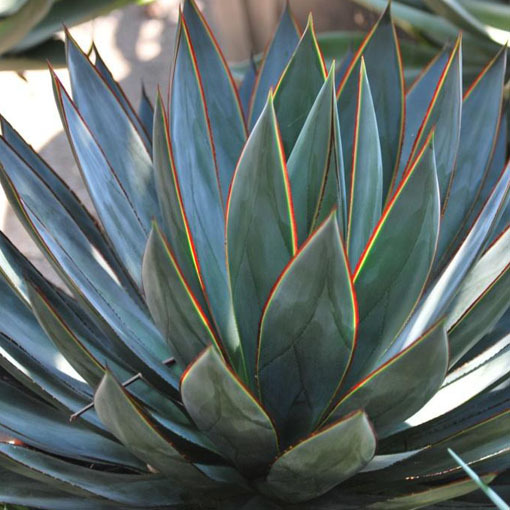 colorata (Mescal Ceniza) – This rosette-forming succulent agave from coastal northwestern Sonora, Mexico is a slowly growing ,rosette-forming plant that reaches to around 2 feet tall by nearly as wide. The 5 to 7 inch wide rough textured blue-gray leaves have undulating and strongly toothed margins and there is a white patterning on the leaf face. This plant is usually solitary and does not often send up many plants around the main rosette. When the plant matures (around 15 years) it blooms in spring with red buds opening to yellow and orange flowers in a panicle on a 10 foot tall stalk. Plant in full sun with good drainage. Water infrequently. Hardy to 18°F.zones8-11 Term aff. refers to the fact that the selection we are tissuing is similar but not identical to the species colorata.